During Lent, a 40-day period serving as a reminder of Jesus’ profound sacrifice and ultimate resurrection on Easter Sunday, Christians across the globe focus on their faith and cut out the excesses of life, with many fasting and abstaining from indulgent behaviors. Many Christians do not eat meat each Friday during Lent, also abstaining on Ash Wednesday and other holy days of obligation. That makes Lent an ideal opportunity to incorporate new meatless recipes, including seafood, into one’s culinary repertoire. The following recipe for “Roasted Black Bean Cod” from “Low Fat for Life” (DK Books) by Sue Kreitzman can certainly fit the bill. Crush together the garlic and ginger and put in a wok with the chopped scallions, stock and sherry. Simmer briskly until the liquid has almost evaporated. Stir in the oyster, chili and black bean sauces and bring to a boil. Continue to boil, stirring for a few seconds. Stir in the passata, and then simmer briskly for 30 seconds. Stir in the lime juice and chopped cilantro and simmer for a few seconds longer. Crush together the garlic and ginger and put in a bowl with the teriyaki sauce and vinegar. 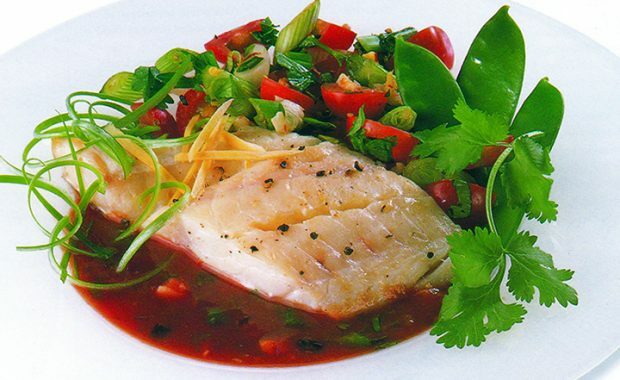 Put the cod on a plate and cover with the ginger-garlic mixture. Grind over some pepper. Marinate at room temperature for approximately 20 minutes. Mist a baking sheet with the oil-water spray. Put the cod on the sheet, scraping all of the marinade over the fish. Spray with oil and oven-roast for 9 to 10 minutes per one-inch thickness of fish. Spoon the heated Black Bean Tomato Sauce onto a plate. 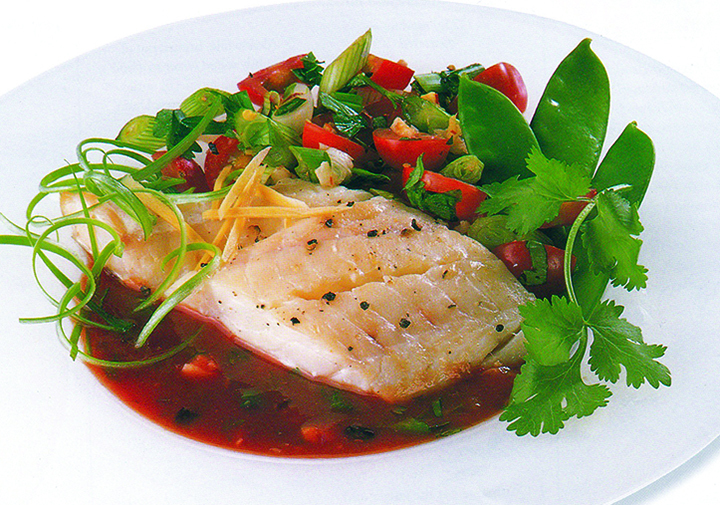 Set the roasted fish on top, then surround with salsa as garnish.